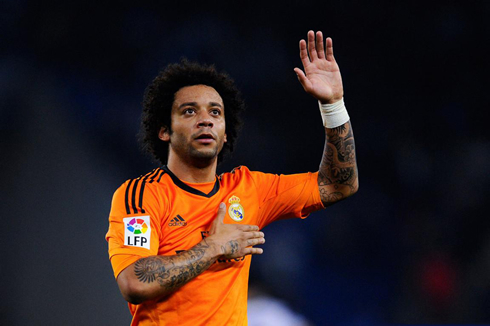 ﻿ Espanyol 0-1 Real Madrid. A header from Pepe saved the day! 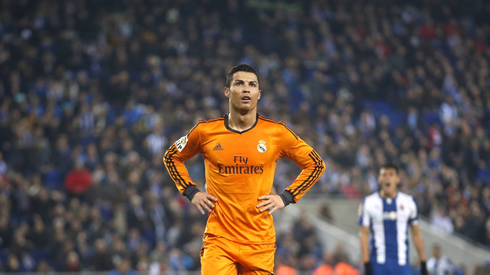 12.01.2014 » Espanyol 0-1 Real Madrid. A header from Pepe saved the day! Real Madrid has shortened distances to La Liga leaders Barcelona and Atletico Madrid, after pulling off a difficult 1-0 away win last night against Espanyol. The Merengues only scored their winning goal during the 2nd half and even with so many superstars upfront in the attack, it had to be Pepe showing his teammates how it's done. The sweet feeling of getting the three points in the bag! That's what Real Madrid brought home from their visit to Espanyol this Sunday night and that's also the point gap between the Merengues and La Liga co-leaders FC Barcelona and Atletico Madrid. Carlo Ancelotti's men fought a hard battle in the "Cornellá El-Prat" stadium and managed to come on top at the end, in great part thanks to impressive performances coming from Pepe at the back and Luka Modric in midfield. Madrid reached their only goal in the game precisely on a play involving the Croatia international and the Portuguese defender, as it was a Modric cross that allowed Pepe to give the Merengues the lead. Cristiano Ronaldo completed his second straight game without scoring and quite simply had one of those nights where nothing went his way. Winning last night's game was absolutely vital, especially after seeing both Barça and Atletico Madrid dropping 2 points this past Saturday. The game had a high level of difficulty label and a good way to proove that is simply to point the fact that Espanyol was the only team to have beaten Atletico Madrid this season (in both La Liga, UEFA Champions League and Spanish Super Cup). Carlo Ancelotti didn't change his team much since last Thursday's Copa del Rey match, excepting bringing on Di María for Jesé, Xabi Alonso for Asier Illarramendi and Carvajal for Arbeloa. In the goal, Diego Lopéz replaced Iker Casillas, as it has been happening every single time this season in La Liga. The first half got to its end with a goalless draw, but with Real Madrid clearly showing signs that they were at least controlling their opponent's intents of scoring a goal. Something wasn't ticking right in the attack though, since Di María, Gareth Bale and Cristiano Ronaldo were clearly going through an uninspired night. The Portuguese player even found himself with a couple good chances to break the deadlock, but for one reason or another, he didn't show that deadly instinct that he so often exhibits week in and week out. Ancelotti couldn't be happy with the result, but was surely not disliking his team's performance so far. Therefore, the Italian manager didn't change anything during the break, probably hoping that the same men that he had chosen to start the game could still be capable of pulling off the win. The second half was about to start and Real Madrid was aware they had 45 minutes left to prove they are a serious contender to this season's La Liga title. It took about 10 minutes inside the second half for the visitors to finally take the deserved lead. Luka Modric stepped forward to take a free-kick close to the corner flag on Madrid's right attacking side and sent in a perfect weighed cross into the far post. In the air appeared Pepe, raising above all his opponents to meet his teammate's cross and head the ball powerfully from top to bottom, just as this sport's rule book recommends. It was a crucial goal and all the players on the pitch realized the importance of the moment when they celebrated effusively around the unusual goalscorer. It was actually Pepe's 3rd goal in La Liga this season, which is already a personal best even though we've just reached the league's mid-point following the completion of this weekend's fixtures. Real Madrid held on to the lead in the remaining time of the game and as Espanyol started risking more by moving players up on the pitch, the visitors also started getting a lot more space to exploit through counter-attacks, precisely what this team likes doing the most. Unfortunately and as referred above, Real Madrid's attacking men were on a off-night and none of the chances they've got ended up being succesfully taken. Similarly to what had happened last Thursday, Cristiano Ronaldo had another game display very far from what he got us used to in the past years. The Real Madrid forward wasted a handful of good goalscoring chances, including a blatant opportunity close to the final whistle that came off a rebound from a Benzema shot, and where he basically had just an empty net in front of him. However and since Diego Costa also didn't score any goal on last Saturday's goalless draw between Atletico Madrid and Barcelona, Ronaldo will keep ranked as La Liga's top goalscorer at least for another week. Tomorrow (January 13) will be a big day for Ronaldo, as he will be attending the FIFA Ballon d'Or ceremony/gala in Zurich, and he'll do it being rated as the odds-favorite to take home his 2nd award of this kind (he won his first in 2008, after having won the UEFA Champions League and while still playing for Manchester United). You can watch Juventus live stream, the full ceremony this Monday evening from a live streaming link picked from this site, as we'll be providing several streams from our usual Real Madrid game page.